William W. Heath, of Newbury, was born September 3, 1842. He enlisted September 4, 1861, and was mustered into U. S. service as a Private in Co. H, Fourth Vermont Volunteer Infantry on September 21, 1861. The Fourth Infantry became part of the fabled The Vermont Brigade. The brigade was at Gettysburg in early July 1863, and saw action at Funkstown in later in the month. In August, the Brigade was detached from the VI Corps, and sent to New York City to help control the draft riots that had broken out there. According to his diary he left land on the steamship Illinois from Alexandria, Va. on August 18, arrived New York the 20th. He was on guard in Washington Square until leaving New York on the 'Cumbra' (?) September 11, arriving in West chester (?) on the 13th. He switched boats there and got on the 'Philadelphia,' and arrived in Alexandria on September 16. The brigade rejoined the VI Corps near Culpeper Court House on the 22nd. The brigade was involved in the Bristoe Campaign, October 9-22, the advance to the Rappahannock November 7 and 8, and the Mine Run Campaign November 26 to December 2. Heath reenlisted February 13, 1864. 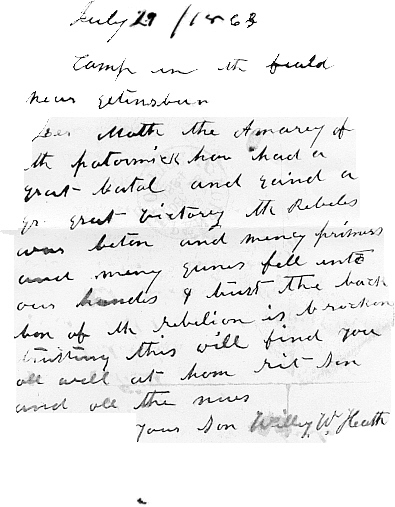 Of less that 550 enlisted men from the Fourth Regiment engaged at the Wilderness, forty-one were killed outright, including Private William W. Heath, who fell the first day, May 5 1864. 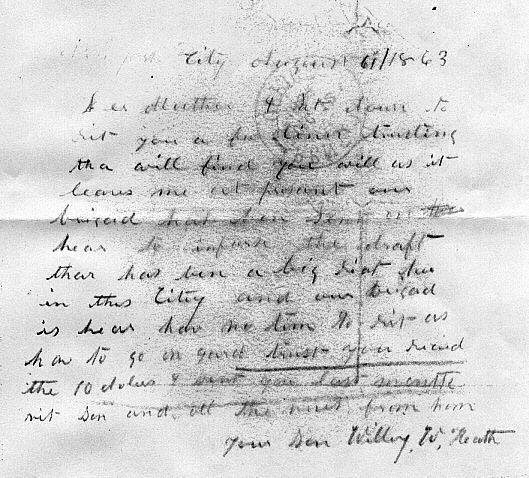 The following letters were contained in pension records obtained from the National Archives by Nancy Flock. For a photograph of Private Heath, please see the Selected Civil War Photographs, 1861-1865, Library of Congress, from the "American Memories" Collection. Article compiled from material provided by Nancy Flock, Burlington. Originally from Poughkeepsie, N.Y., Nancy moved to Burlington three years ago. Her ggg grandfather was in the NYV 161st, along with 3 of his brothers, in other regiments, so that started her Civil War interest.